Written at 13:48:34 on Saturday, 2nd December, 2017. Vintage Radio was first developed in late 2003 as part of a campaign to boost the amount of Australian web content related to the hobby of collecting and restoring old valve radios. The site began life as a personal website which described the owner's collection and contained some other vintage radio related information. One of the big achievements, I believe, has been the introduction of site membership and the discussion forums. This has created a network of enthusiasts who have come together to share knowledge and experience with those who are new to the hobby. The forums were opened for the first time on the 15th November, 2005. It is a goal of mine to make sure that as much information is available to all interested people, on-line and free of charge. What did the old sites look like? Curiosity is a good thing and part of the reason why sites like Vintage Radio exist. In keeping with the historical nature of this website I have decided that placing a visual timestamp of its past here so that you can see the way things were. Please click here to view screenshots of the front pages of old site designs. Call it how you see it, though I believe the site has vastly improved in design over the time. I hope you think so too. My name is Brad and I am in my mid forties. I live in Sydney which is the capital city of New South Wales, Australia and also Australia's largest city. I have been collecting and restoring old radios for about thirty years and have never grown tired of wanting to have one more set on the shelves. Every collector has a favourite brand and I am no exception. I have a soft spot for AWA and in particular their Radiolettes of the late 1940's. I currently own six of the seven colours known to me in the 1940's models, they being: walnut, white, cream, jade, turquoise, burgundy. Whilst on the subject of small coloured mantel receivers, in recent years I have been gathering a collection of the Healing L401E, a similar size to the 500-series Radiolettes but available in many more colours. So far I have walnut, ivory, marbled ivory, mottled yellow, mottled green, dark green, burgundy and black. There's three or four others still to get. Did I hear you ask about timber radios? Yes, I do collect them too and they are certainly just as collectable as the coloured bakelite sets. The timber radios come in a few styles. I have several mantel receivers including the AWA R24 Radiolette and it's AGE Bandmaster equivalent, an Astor Mickey Mouse model OZ and a Raycophone Peewee. I have a few very large table models, a HMV 886 and the slightly smaller 881, an Airzone 504 and a large STC one (model unknown). Finally we head back to the 1920s with several coffin-shaped radios. An Astor 'Little Astor', which I may add is not so little; An AWA C62 Radiola, a Radiair (model unknown) and a Udisco (model unknown). Each of these has its own timber or metal flared horn speaker that was typical for the period. Is my collection complete? No chance. There's no such thing as a complete collection of valve radios, although some people who have a lot of room at home or a dedicated shed out back have certainly tried to get at least one of every radio ever made. It's most likely not possible though. 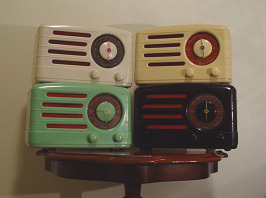 Australia, probably due to its locked-down electronics industry at the time, was the maker of millions of radios covering thousands of models in anything from a plain-Jane timber or brown bakelite up to the dozen or so colours some bakelite models came in. Anyone that was to ever complete the task would be doing exceptionally well.